The Cornwall team took on the 9 hour journey to Temple Newsam Park in Leeds hoping that the forecast for race day of heavy rain and 45mph winds was wrong, and fortunately this was the case. 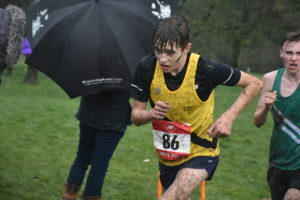 A tough, muddy course with virtually no flat tested the athletes’ fitness to the full and the Cornish youngsters weren’t found wanting. 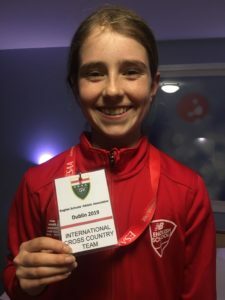 Star of the show was Maisey Luke (Richard Lander), who coped admirably with the pressure of her first chance of an international vest (the first 8 are selected to represent England Schools at the S.I.A.B. International in Dublin this Saturday) to aggressively attack the hills, eventually dropping all but the winner, Kiya Dee from Gloucestershire. 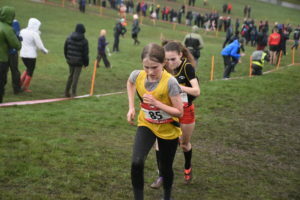 With Kiya surging to a clear gap after halfway, Maisy pulled 2 others away from the chasing pack and then edged clear of them with an all-in effort up the last 400m hill into the strong wind to the finish line to take the silver. Isaac Murray (Truro School) 26th a year young in the Inter Boys race, with Ed Mitchell (Penryn) 51st. Imogen Wood (Truro College) a superb 11th in the Senior Girls, with Erin Burt (Truro College) 40th and Louise Mitchell (Truro College) 45th. Senior Boys Harris Mier (Truro School) 41st, Floyd Ratcliffe (Truro College) 53rd and Bradley Stevens (Duchy College) 73rd.